TAIPEI - A Taiwanese farmer held a two-day dragon fruit sale in Taipei over the weekend to raise money for victims of the floods and landslide in western Japan. Lin Ting-tsai, 65, said he harvested 1,380 kg of red dragon fruit at his farm in Yilan County in eastern Taiwan and decided to sell some of it for a good cause. He said he would donate the money collected from the sale of 900 kg of the crop, the first of his four annual harvests, to the flood victims in Japan in light of the news reports on the disaster. Lin said he estimated that the two-day sale could bring in between 100,000 and 120,000 new Taiwan dollars (¥364,000 to ¥439,000). The sale ended Sunday. Lin began to grow organic red dragon fruit three years ago and organic kumquat about 10 years ago, in Yilan. His dragon fruit won third place in a quality contest in Yilan this year. He said when he was growing peaches, apples and pears in Taichung, central Taiwan, he took huge losses from a typhoon. This impressed on him how farmers live at the mercy of the elements and made him all the more willing to help others in need, he said. 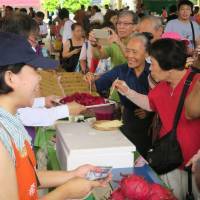 Facilitating the sale at a weekend farmer’s market in downtown Taipei was Hu Jong-Im, new chief of the island nation’s Agriculture and Food Agency. Hu said he decided to help out after hearing from an old friend about Lin’s interest in raising money for the flood victims. Hu noted how both Japan and Taiwan are prone to natural disasters like earthquakes and typhoons. “Japan is our neighbor. We always help each other out when disasters strike,” he said, citing the assistance received from Japan after a devastating earthquake on Sept. 21, 1999, a powerful quake in Tainan in February 2016 and another that rattled Hualien in February this year. “I hope the two-day sale will strengthen the friendship between Taiwan and Japan,” Hu said. While Taiwan can export only white dragon fruit to Japan, Hu urged the Japanese government to allow imports of red dragon fruit. The sale was also observed by Mitsuhiro Yokota, chief deputy representative of the Japan-Taiwan Exchange Association, Japan’s unofficial diplomatic mission in Taiwan. Yokota said he has been touched by Taiwan’s responses. The first was Taiwan President Tsai Ing-wen’s encouraging Twitter messages, which were followed by a donation by Taiwan’s Foreign Ministry and the dragon fruit sale. 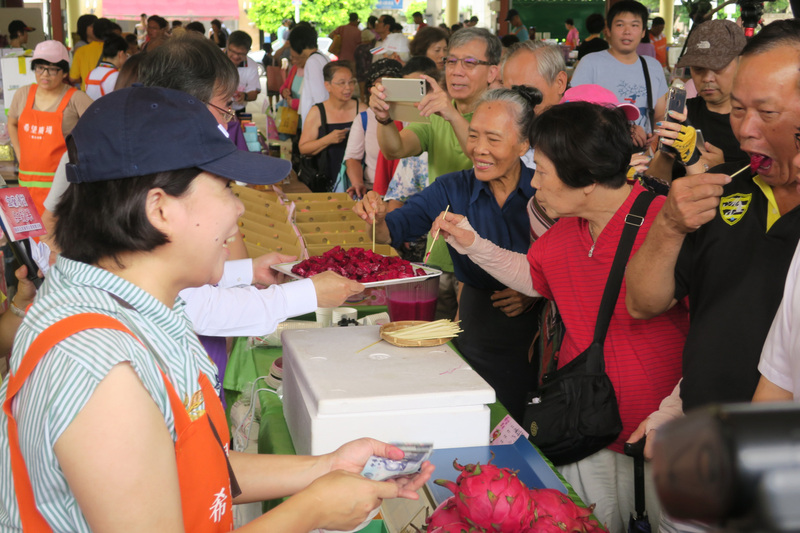 The weekend sale attracted many to Lin’s stand at the market, with people lining up to test juice, smoothies and ice pops made of dragon fruit. Among them was a Japanese man who has been working in Taiwan for six years. The man, who withheld his name, said he was completely blown away by the Taiwanese people’s affection for Japan. “It makes me examine myself whether I love my country as much as they do,” he said, shedding tears. He said that he would very much like to see Japan and Taiwan establish diplomatic ties and that they should never give up trying.